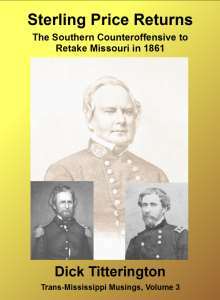 Trans-Mississippi Musings Press has just released "Sterling Price Returns: The Southern Counteroffensive to Retake Missouri in 1861"
It’s the summer of 1861 and the Missouri State Guard has just won a fight with Federal volunteers from Missouri in the Battle of Carthage. Having been driven to the extreme southwestern part of Missouri by the Federals, Major General Sterling Price is eager to launch a counter-offensive and retake control of the State of Missouri. But first Price needs to convince Brigadier General Ben McCulloch to ally his Confederates with Price’s Missouri State Guard. Combined, the Southerners will have the strength to defeat the army being assembled by Federal Brigadier General Nathaniel Lyon. The Southern allies march north and meet the Federals just ten miles south of Springfield, Missouri along a stream called Wilson’s Creek. After the fight at Wilson’s Creek, Sterling Price marches his Missouri State Guard north to try and capture the key Missouri River town of Lexington, Missouri. In response, Major General John Charles Fremont, mobilizes the forces under his command in Missouri to pursue and destroy the Missouri State Guard. Fremont’s army finally catches up with the Missouri State Guard in Springfield later that fall. Don’t miss volume 3 in the series, Trans-Mississippi Musings.